Jeep's special editions of the Grand Cherokee SRT8. 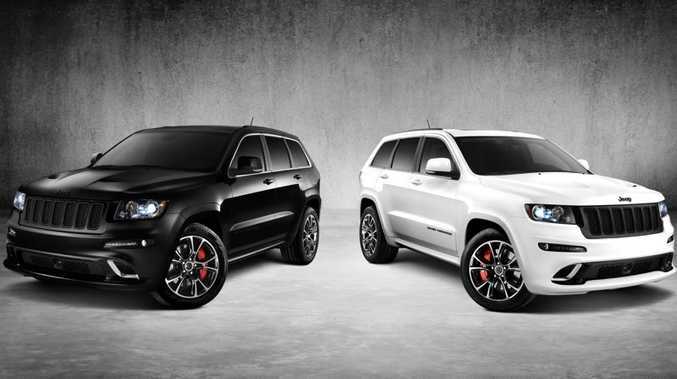 TWO new special editions of the Jeep Grand Cherokee SRT8 will arrive in January - the Alpine and Vapor. Both are priced from $81,900 plus on-roads. Offered as part of the initial launch phase of the new Jeep flagship, the SRT Alpine and Vapor limited editions come with some stylish design differences. The Apline is finished in "bright white" - a limited colour for the Grand Cherokee SRT8 line-up, while brilliant black graces the Vapor's exterior, and both feature SRT design 20-inch split five-spoke wheels finished in black chrome. In both editions, the Jeep bonnet badge and Grand Cherokee door badges are exchanged in favour of gloss black lettering. Each vehicle receives gloss black grille inserts housed within gloss black grille surrounds. Continuing the striking monochromatic theme, the rear step pad is finished in gloss black, while the rear light bar receives the same treatment. The SRT badge found on the tailgate is also tweaked, featuring a black flag as the accent colour rather than red as seen on the standard Grand Cherokee SRT8. Extra specifications included on both editions include the addition of a dual pane panoramic sunroof and 19 speaker SRT high performance audio system. The Alpine and Vapor Grand Cherokee SRT8s will be limited to 200 units each. Alpine editions are now available in Jeep dealerships, whilst Vapor editions will go on sale late January, 2013.